AFCAT Syllabus for General Awareness : History, Sports, Geography, Environment, Civics, Basic Science, Defence, Art, Culture, Current Affairs, Politics etc. AFCAT Syllabus for Verbal Ability in English: Comprehension, Error Detection, Sentence Completion, Synonyms, Antonyms and Testing of Vocabulary. Numerical Ability – Decimal Fraction, Simplification, Average, Profit & loss, Percentage, Ratio & Proportion and Simple interest. EKT (Engineering Knowledge Test) is the examination aimed at testing the basic knowledge of engineering required for the technical branch. Technical branch includes course of Aeronautical Engineering (Electrical and Mechanical). This examination is pitched at pre- final to final year engineering level. Total 75 Objective type questions will be asked in the examination and the duration is 01 hour. All applicants whose online applications have been successfully submitted will be called for Air Force Common Admission Test (AFCAT) and Engineering Knowledge Test (EKT) (applicable only for candidates applying for technical branch). EKT would be for 45 minutes and conducted immediately after AFCAT. The duration of AFCAT 2019 Exam will be 2 Hours and EKT exam will be for 45 mins. Candidates who will clear the AFCAT exam 2018 will be called for further SSB interview process which is also known as AFSB interview. 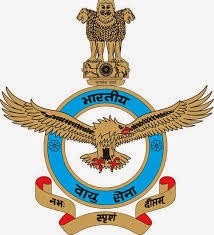 AFSB stands for air force selection board which are located at Mysore, Dehradun, Varanasi and Gandhinagar. Selection will be based on score in Engineering Knowledge Test (EKT) (applicable to technical posts only) & Air Force Common Admission Test 2017. After qualifying AFCAT & EKT, contenders will be invited for Medical Test, Intelligence Test, Group Test, Psychological Test and Interview Test round organized by Air Force Selection Boards (AFSBs). All of applicants of Flying Branch should to attempt for Computerized Pilot Selection System (CPSS), Pilot Aptitude Battery Test (PABT). AFCAT Exam will be of two hours duration and will contain multiple choice questions on verbal ability, numerical ability, reasoning, general awareness and military aptitude. Candidates opting for ground duty (technical) branch to pass both AFCAT and EKT. Stage-II- Testing consisting of Psychological, Group Tests and Interview and For Flying Branch, Computerized Pilot Selection System (CPSS) would be administered to eligible candidates. The Training is scheduled to commence in the first week of January 2018 for all courses. Duration of training for Flying and Ground Duty (Technical) Branches is 74 weeks and that of Ground Duty (Non-technical) Branches is 52 weeks. One common test of 100 questions is to be solved by all candidates in 2 hours. Technical Branch candidates have an addition test of EKT, both tests are objective. Successful candidates get a chance to appear for AFSB, and recommended candidates can be called for training based on their rank in the merit list and subject to medical fitness. IAF will conduct AFCAT written test in Offline Mode. Questions in the AFCAT question Paper, shall carry of 300 marks. Question will have four section in which each section containing questions from different subjects. Each question have 04 options, in which you need to mark one appropriate answer. Each question carry of 03 marks and each wrong answer deduct 1/3 or 1 mark. Total time duration will be 02 hours (120 Minutes). IAF will conducting EKT written test in Offline Mode. EKT would be for 45 minutes and conducted immediately after AFCAT exam on same day. Here you can get the detailed topic wise EKT Syllabus with exam pattern. Contenders can make use of the provided contents for their practice and try to score best marks in going to appear exam. Fundamental Engineering: Engineering Mathematics, Engineering Physics, Engineering Drawing. Specialization Branch Topics : Analogy and Digital Electronics, Electronic Devices, Computer Networks, Network Theory Design, Switching Theory, Information Technology. Allied Engineering: Electrical Engineering, Control Engineering, . Telecommunication Systems, Microwave Engineering, Antenna and Wave Propagation, Radar Theory, Instrumentation. Fundamental Engineering : Engineering Mathematics, Engineering Physics, Engineering Drawing. Specialization Branch Topics : Analog and Digital Electronics, Electrical Engineering, Electronic Devices, Control Engineering, Telecommunication Systems, Microwave Engineering, Antenna and Wave Propagation. Fundamental Engineering: Engineering Mathematics, Engineering Physics, Engineering Graphics/ Engineering Drawing. Specialization Branch Topics : Engineering Mechanics, Thermodynamics, Theory of Machines, Fluid mechanics/Hydraulic Machines, Manufacturing Science, Materials Science, Machine Drawing. Allied Engineering: Automotive Engineering, Power Plant Engineering, Industrial Engineering, Flight Mechanics, Aircraft Structures, Aerodynamics. Ambala, Amritsar, Allahabad, Agra, Ahmedabad, Barnala, Bathinda, Bengaluru, Belgaum, Bidar, Bagdogra, Bareilly, Chandigarh, Chabua, Chennai, Dehradun, Delhi, Darbhanga, Gorakhpur, Gwalior, Guwahati, Halwara, Hashimara, Hyderabad, Imphal, Jalandhar, Jammu, Jorhat, Jaipur, Jamnagar, Jodhpur, Kanpur, Kolkata, Kalaikunda(Kharagpur), Kochi, Leh, Lucknow, Mumbai, Mohanbari, Mysore, Nal (Bikaner), Nagpur, Ojhar (Nasik), Pathankot, Patna, Pune, Port Blair, Salua (Kharagpur), Srinagar, Suratgarh, Sirsa,Saharanpur, Shillong, Silchar, Sulur (Coimbatore), Thane, Tezpur, Thanjavur, Thiruvananthapuram, Vadodara, Varanasi. The awareness of equal corruption will be a better emotional basis for the so-called multiracial commonwealth, of which much is made, than its professed principle-the pursuit of common aims in world politics, aims which are so rarefied that a large volume of artificial political oxygen is needed to keep that body-politic breathing. After all, it cannot be denied that even the United States and the Soviet Union are pursing common aims in world affairs, such as peace, disarmament, democracy, technological progress, as well as freedom as understood by each. But that is not preventing them from doing things which might lead to the destruction or near destruction of mankind. Thus, common aims would seem to be very undependable as guarantees for goodwill and co-operation among nations. On the contrary, a frank admission of being equal sinners would at least encourage charity and discourage moral arrogance. That would be a better foundation for integration for international and multi-racial co-operation. Q5. The thrust of the author’s argument is that (a) the Commonwealth has outlived its utility (b) membership of the Commonwealth be restricted to the super powers (c) members are equally responsible for the present state of world politics (d) international peace and co-operation are unattainable. Q5. If I was you (a)/ I would not have(b)/ committed this blunder(c). No error (d). This is a test of your ability to understand words. For each question in the test there are four possible answers: A, B, C, or D. There is only one correct answer for each question. Read each question carefully and decide which one of the four answers is the best one. Mark your answer on the answer sheet by blacking out the letter that corresponds to your choice. Q1.What number should come next in the sequence? In the Block Rotation subtest, you will see blocks of different shapes, with cubes, cylinders, and other objects on them. In the examples below, you see six images. The image in the upper left-hand corner shows the model block. One of the five images labeled A through E also shows the model block, but rotated in space. The remaining images show a different block, rotated to various positions in space. 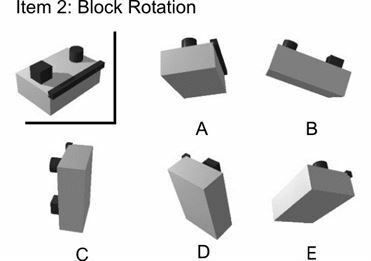 Your task is to choose from the images labelled A through E the image that shows the model block rotated in space.